Precipitation accumulates in many bogs forming bog pools. 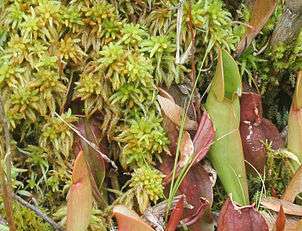 A bog is a wetland that accumulates peat, a deposit of dead plant material—often mosses, and in a majority of cases, sphagnum moss. 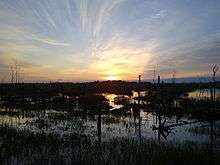 It is one of the four main types of wetlands. 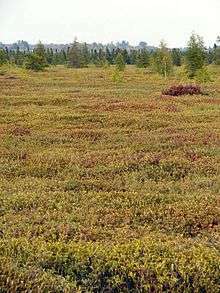 Other names for bogs include mire, quagmire, and muskeg; alkaline mires are called fens. 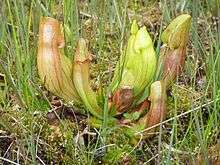 They are frequently covered in ericaceous shrubs rooted in the sphagnum moss and peat. The gradual accumulation of decayed plant material in a bog functions as a carbon sink. 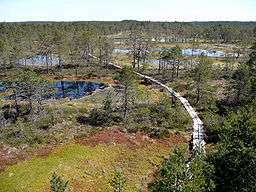 Bogs are widely distributed in cold, temperate climes, mostly in boreal ecosystems in the Northern Hemisphere. The world's largest wetland is the peat bogs of the Western Siberian Lowlands in Russia, which cover more than a million square kilometres. 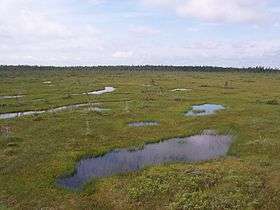 Large peat bogs also occur in North America, particularly the Hudson Bay Lowland and the Mackenzie River Basin. They are less common in the Southern Hemisphere, with the largest being the Magellanic moorland, comprising some 44,000 square kilometres. Sphagnum bogs were widespread in northern Europe but have often been cleared and drained for agriculture. There are many highly specialised animals, fungi and plants associated with bog habitat. Most are capable of tolerating the combination of low nutrient levels and waterlogging. Sphagnum moss is generally abundant, along with ericaceous shrubs. 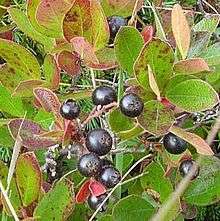 The shrubs are often evergreen, which is understood to assist in conservation of nutrients. In drier locations, evergreen trees can occur, in which case the bog blends into the surrounding expanses of boreal evergreen forest. Sedges are one of the more common herbaceous species. Carnivorous plants such as sundews (Drosera) and pitcher plants (for example Sarracenia purpurea) have adapted to the low-nutrient conditions by using invertebrates as a nutrient source. Orchids have adapted to these conditions through the use of mycorrhizal fungi to extract nutrients. Some shrubs such as Myrica gale (bog myrtle) have root nodules in which nitrogen fixation occurs, thereby providing another supplemental source of nitrogen. Bogs are recognized as a significant/specific habitat type by a number of governmental and conservation agencies. They can provide habitat for mammals, such as caribou, moose, and beavers, as well as for species of nesting shorebirds, such as Siberian cranes and yellowlegs. The United Kingdom in its Biodiversity Action Plan establishes bog habitats as a priority for conservation. Russia has a large reserve system in the West Siberian Lowland. 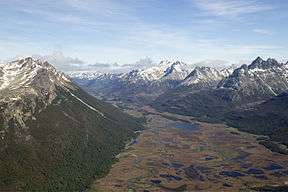 The highest protected status occurs in Zapovedniks (IUCN category IV); Gydansky and Yugansky are two prominent examples. Bogs even have distinctive insects; English bogs give a home to a yellow fly called the hairy canary fly (Phaonia jaroschewskii), and bogs in North America are habitat for a butterfly called the bog copper (Lycaena epixanthe). A quaking bog or schwingmoor is a form of bog occurring in wetter parts of valley bogs and raised bogs, and sometimes around the edges of acidic lakes. The bog vegetation, mostly sphagnum moss anchored by sedges (such as Carex lasiocarpa), forms a floating mat approximately half a metre thick, on the surface of the water or on top of very wet peat. White spruces are also common in this bog regime. Walking on the surface causes it to move – larger movements may cause visible ripples on the surface, or they may even make trees sway. 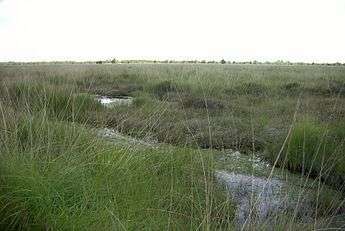 In the absence of disturbance from waves, the bog mat may eventually cover entire bays, or even entire small lakes. After drying, peat is used as a fuel, and it has been used that way for centuries. More than 20% of home heat in Ireland comes from peat, and it is also used for fuel in Finland, Scotland, Germany, and Russia. Russia is the leading exporter of peat for fuel, at more than 90 million metric tons per year. Ireland's Bord na Móna ("peat board") was one of the first companies to mechanically harvest peat, which is being phased out. The anaerobic environment and presence of tannic acids within bogs can result in the remarkable preservation of organic material. Finds of such material have been made in Denmark, Germany, Ireland, Russia, and the United Kingdom. Some bogs have preserved bog-wood such as ancient oak logs useful in dendrochronology, and they have yielded extremely well preserved bog bodies, with hair, organs, and skin intact, buried there thousands of years ago after apparent Germanic and Celtic human sacrifice. Excellent examples of such human specimens are Haraldskær Woman and Tollund Man in Denmark, and Lindow man found at Lindow Common in England. At Céide Fields in County Mayo in Ireland, a 5,000-year-old neolithic farming landscape has been found preserved under a blanket bog, complete with field walls and hut sites. One ancient artifact found in bogs in many places is bog butter, large masses of fat, usually in wooden containers. These are thought to have been food stores, of both butter and tallow. 1 2 3 4 5 "British Soil Is Battlefield Over Peat, for Bogs' Sake". The New York Times. 6 October 2012. Retrieved 7 October 2012. 1 2 L.H. Fraser and P.A. Keddy (eds.). 2005. The World’s Largest Wetlands: Ecology and Conservation. Cambridge University Press, Cambridge, UK. ↑ Smith, David (2014-05-27). "Peat bog as big as England found in Congo". The Guardian: World news. Retrieved 2014-05-31. ↑ Keddy, P.A. 2010. Wetland Ecology: Principles and Conservation (2nd edition). Cambridge University Press, Cambridge, UK. Chapter 3. ↑ Keddy, P.A. 2007. Plants and Vegetation: Origins, Processes, Consequences. Cambridge University Press, Cambridge, UK. ↑ Archibold, O. W. (1995). Ecology of World Vegetation. London: Chapman and Hall. ↑ Bond, G. (1963). In Plant Physiology, eds. F. B. Salisbury and C. W. Ross (1985), 3rd edn, p. 254, Figure 13.3. Belmont, CA: Wadsworth. ↑ Solomeshch, A.I. 2005. The West Siberian Lowland. Pp. 11-62 in L.H. Fraser and P.A. Keddy (eds.). The World’s Largest Wetlands: Ecology and Conservation. Cambridge University Press, Cambridge, UK. ↑ Glaser, P. H. (1992). Raised bogs in eastern North America: regional controls for species richness and floristic assemblages. Journal of Ecology, 80, 535–54. ↑ Damman, A. W. H. (1986). Hydrology, development, and biogeochemistry of ombrogenous bogs with special reference to nutrient relocation in a western Newfoundland bog. Canadian Journal of Botany, 64, 384–94. ↑ van Breeman, N. (1995). How Sphagnum bogs down [sic] other plants. Trends in Ecology and Evolution, 10, 270–5. 1 2 3 Heinrich Walter and Siegmar-W. Breckle, Ecological Systems of the Geobiosphere:3 Temperate and 3 Polar Zonobiomes of Northern Eurasia, Stuttgart: Springer, 2012, pp. 463-464. ↑ de Róiste, Daithí. "Bord na Móna announces biggest change of land use in modern Irish history". Bord na Móna. Bord na Móna. Retrieved 6 October 2015. ↑ Campbell, D. R. and Rochefort, L. (2003). "Germination and seedling growth of bog plants in relation to the recolonization of milled peatlands", Plant Ecology, 169, 71–84. ↑ Cobbaert, D, Rochefort, L., and Price, J. S. (2004). "Experimental restoration of a fen plant community after peat mining," Applied Vegetation Science, 7, 209–20. ↑ The RSPB: Policy Archived 30 September 2007 at the Wayback Machine. ↑ Gorham, E. (1991). 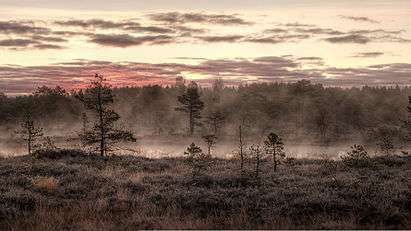 Northern peatlands role in the carbon cycle and probable responses to climatic warming. Ecological Applications, 1, 182–95. "Bog". Encyclopædia Britannica (11th ed.). 1911. "Bog". The American Cyclopædia. 1879.